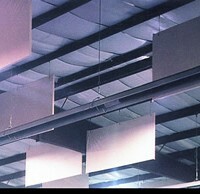 Clouds and baffles are unique in that they combine noise and reverberation reduction with architectural effects. For exceptional acoustical control in large, open spaces, clouds and baffles offer outstanding control across all frequencies as well as outstanding design flexibility. 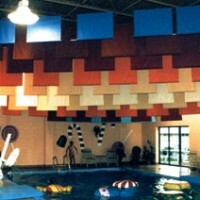 These products solve challenging acoustical problems in concert halls, auditoriums, gymnasiums, or meeting halls to aid in improving sound quality and occupant enjoyment. The proprietary products we supply come in many forms, shapes, thicknesses, materials, colors, and price points to meet your specific needs. 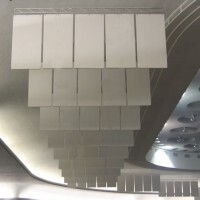 Clouds and baffles are unique in that they combine noise and reverberation reduction with architectural effects to add visual beauty and interest to a space. 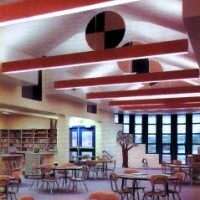 Unlike full ceilings, clouds and baffles are installed in specific places that need acoustical control. 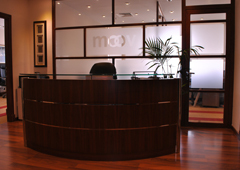 Want to add interest and acoustical control together? 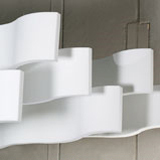 Take a look at the WHISPERWAVE™ system of ceiling clouds. 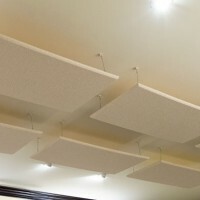 These custom sized curved panels are lightweight, easy to install, visually interesting, and greatly improve acoustic qualities. Clouds and baffles bring together sound reduction and aesthetic qualities for the best in function and form. See some of our exceptional line above, and feel free to Contact us any time.